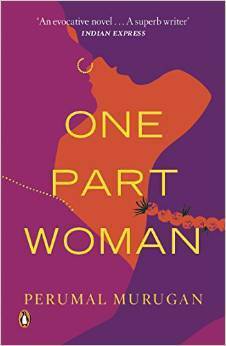 “One Part Woman” – Book Review | The ugly face of society..
‘One Part Woman’ was originally written in Tamil and published in 2010 as ‘Madhorubdagan’. Initially, it was well-received but garnered major controversy later and even led to the author giving up writing as a profession. As I read through, I could see why there was so much controversy regarding it! This book was one of the most socially important books I have read this year. It is a glaring eye-opener to the face of society at it’s ugliest.. and you know what hurt’s the most? The realization that this is real.. the author has used some really bold twists and acts in the story to personify the ugliness and how certain old time beliefs.. once created out of illiteracy and ignorance, still have their roots strong in the modern man’s mind and is still poisoning lives and relationships. The ancient ritual of a night of relaxation from social stigma to let passion flow freely may be a fictional concept but the way the author has used it in the story really brings out the cruel face of the society.. the levels to which it can stoop, the levels to which it can make even your own family stoop under social pressure.. under the fear of isolation. Even when you are at your strongest, the monster called society is capable of tearing you apart. The book is radical in it’s thought and bold in it’s execution. It managed to enrage me and made me think over and over about the behavior of society in different contexts. How it hurts each one of us personally at our soft spots.. how effortlessly it seems to figure out our lack of something we yearn for and manages to hit us right where it will hurt the most. I would recommend it to you is you are looking for something that will make you think deeply. Looking forward to reading his other works. Previous Post “Sniper’s Eye” – ARC Review | Cleverly Crafted..
Next Post “Rakshasas: The Shadow Warriors (The Vedic trilogy #2) | A treat for the mythology and ancient history buffs! Perumal is current fav !